J took ﻿the week off. It has been glorious. We explored land that has been covered in snow since we moved in. 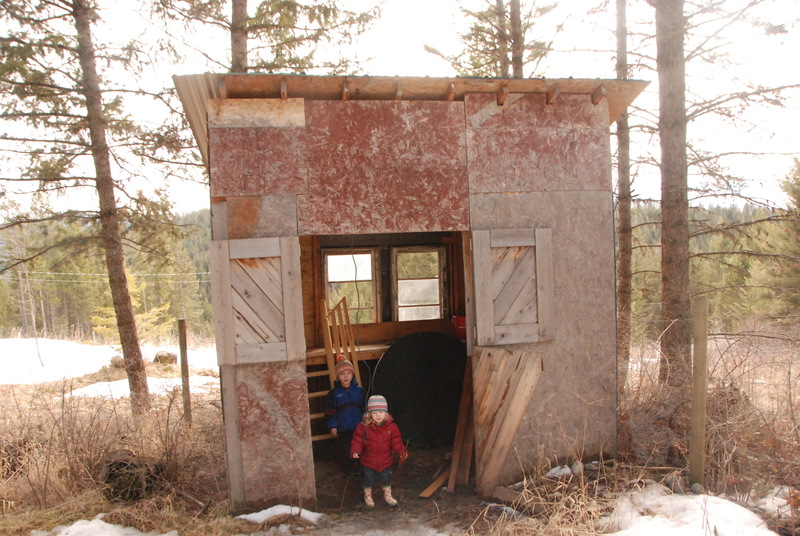 We did projects that have been making Joel itchy to complete: the shed that met with a runaway trailer and sheared off the power, the playhouse that needed to be started, the car port full of outdoor goods waiting to find homes here. It was the perfect mix of productivity and family time. Family time that was defined an awful lot by siblings becoming ever more intense in their love for one another. You know the kind of love I’m talking about don’t you? The kind of love that would have you throw yourself between a crocodile and your little sister when outsiders threaten but would also throw her off the coffee table sooner than share your Buzz Lightyear doll? Yah…thats what we are living over here. I read a novel this week (for my book club tonight) and it was pretty good. Emerging from this though was a new passion for mothering my daughter well…for sistering my sisters better…for sitting around tables, sipping tea and honouring what it means to be women. I was putting lotion on sweet Ems skin after her bath and all I could think was how I wish I could rub courage into her too. Courage in her skin, so that it would grow with her and so that she would be fearless. That she would know that there are some who are scared and so they don’t, some (like me) that are scared but still try their best to DO IT, and then there are those like her father who are fearless…I pray the later for her. Some friends visited too. I had wanted to have a big party and had many names on an email list, but then when it started to snow I deleted a few knowing we would have to party in the house…and the regret I had for not inviting more dissolved into the chaos of more than enough children on my staircase!!! It was absurd and fun with the children running to every corner of our home. We got a sitter and we went bowling and it was fun to catch up with old friends. Funny how I get out of practice with socializing though…I’ve become clumsy and started like 70 sentences that drifted off before I could finish them. I am one who needs plenty of practice and who could easily hide in the cabin for the rest of my life. I am so lucky to have friends who put up with a klutz like me! So now we prepare for the week to come. Prepare to have commitments again, appointments to go to, preschool to attend, coffee dates to book, meetings to have. We are ready for it…rested and fearless. My kids and I had a very restful spring break as well… we needed to be HOME…together…doing not much else but hanging with our own family. Over the past two weeks I have seen my kids become closer as brother and sisters… playing lego together… playing board games… going on long walks and daily excursions to the playground to meet up with all the neighbor kids. It’s been restful, sweet, and bonding. So thankful for the time.. and I think we are all ready to get back to routine tomorrow. I’ve thought that before too Vanessa! Glad you had some rest friend…no one deserves it more!! !